An instar (/ˈɪnstɑːr/ ( listen), from the Latin "form", "likeness") is a developmental stage of arthropods, such as insects, between each moult (ecdysis), until sexual maturity is reached. Arthropods must shed the exoskeleton in order to grow or assume a new form. Differences between instars can often be seen in altered body proportions, colors, patterns, changes in the number of body segments or head width. After moulting, i.e. shedding their exoskeleton, the juvenile arthropods continue in their life cycle until they either pupate or moult again. The instar period of growth is fixed; however, in some insects, like the salvinia stem-borer moth, the number of instars depends on early larval nutrition. Some arthropods can continue to moult after sexual maturity, but the stages between these subsequent moults are generally not called instars. 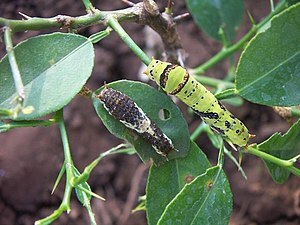 The number of instars an insect undergoes often depends on the species and the environmental conditions, as described for a number of species of Lepidoptera. However it is believed that the number of instars can be physiologically constant per species in some insect orders, as for example Diptera and Hymenoptera. It should be minded that the number of larval instars is not directly related to speed of development. For instance, environmental conditions may dramatically affect the developmental rates of species and still have no impact on the number of larval instars. As examples, lower temperatures and lower humidity often slow the rate of development- an example is seen in the lepidopteran tobacco budworm and that may have an effect on how many molts will caterpillars undergo. On the other hand, temperature is demonstrated to affect the development rates of a number of hymenopterans without affecting numbers of instars or larval morphology, as observed in the ensign wasp  and in the red imported fire ant. In fact the number of larval instars in ants has been the subject of a number of recent investigations, and no instances of temperature-related variation in numbers of instars have yet been recorded. ^ Allaby, Michael: A Dictionary of Ecology, page 234. Oxford University Press, USA, 2006. ^ Knopf, K. W.; Habeck, D. H. (June 1976). "Life History and Entomology of Samea multiplicalis". Environmental Entomology. 5 (3): 539–542. doi:10.1093/ee/5.3.539. ^ Fox, Eduardo Gonçalves Paterson; Solis, Daniel Russ; Rossi, Mônica Lanzoni; Eizemberg, Roberto; Taveira, Luiz Pilize; Bressan‐Nascimento, Suzete (2012-06-01). "The preimaginal stages of the ensign wasp Evania appendigaster (Hymenoptera, Evaniidae), a cockroach egg predator". Invertebrate Biology. 131 (2): 133–143. doi:10.1111/j.1744-7410.2012.00261.x. ISSN 1744-7410. ^ Bressan-Nascimento, S.; Fox, E.G.P. ; Pilizi, L.G.T. (2010-02-01). "Effects of different temperatures on the life history of Evania appendigaster L. (Hymenoptera: Evaniidae), a solitary oothecal parasitoid of Periplaneta americana L. (Dictyoptera: Blattidae)". Biological Control. 52 (2): 104–109. doi:10.1016/j.biocontrol.2009.10.005. ISSN 1049-9644. ^ Porter, Sanford D. (1988-01-01). "Impact of temperature on colony growth and developmental rates of the ant, Solenopsis invicta". Journal of Insect Physiology. 34 (12): 1127–1133. doi:10.1016/0022-1910(88)90215-6. ISSN 0022-1910. ^ Bueno, Odair Correa; Souza, De; Fernando, Rodrigo; Delabie, Jacques Hubert Charles; Rossi, Mônica Lanzoni; Solis, Daniel Russ; Fox, Eduardo Gonçalves Paterson (2012). "Comparative Immature Morphology of Brazilian Fire Ants (Hymenoptera: Formicidae: Solenopsis)". Psyche: A Journal of Entomology. 2012: 1–10. doi:10.1155/2012/183284. Retrieved 2018-12-06. ^ "(Larvae of trap-jaw ants, Odontomachus LATREILLE, 1804 (Hymenoptera: Formicidae): Morphology and biological notes". Myrmecological News. 25: 17–28. January 2017. Retrieved 2018-12-06. ^ Bueno, Odair Correa; Campos, Ana Eugênia de Carvalho; Yabuki, Antonio Teruyoshi; Jesus, Carlos Massuretti de; Kato, Luciane Mayumi; Fox, Eduardo Gonçalves Paterson; Solis, Daniel Russ (2010-01-01). "Morphological description of the immatures of the ant, Monomorium floricola". Journal of Insect Science. 10 (1): 15. doi:10.1673/031.010.1501. PMC 3388976. PMID 20575746.